As More Electric Cars Arrive, What's The Future For Gas-Powered Engines? The vast majority of American cars run on gasoline. But analysts say that's poised to change as electric vehicles take over the market — albeit not as quickly as environmental activists might like. Most American cars run on gasoline. But analysts say that's poised to change as electric vehicles take over the market, although they disagree on how soon. Going electric is not just an eco-friendly goal, an ambition that would help fight climate change. It's a business reality, according to industry analysts. But if the general path ahead is widely agreed on, the speed of the change — and the role that combustion vehicles will play during the transition — is far from clear. Electric vehicles are currently a tiny fraction of the car market, which is dominated by internal combustion engines. But many more electric car models will hit showrooms in the next few years, and several factors have analysts convinced that is part of a major transition in the industry. Government policies — particularly in Europe and China — are giving a boost to electric vehicles, as regulators consider not only the devastating impacts of climate change but also the value of improved air quality in cities. Auto companies around the world are gearing up for what will be a massive financial commitment. Carmakers plan to invest more than $90 billion in the shift to electric vehicles over the next decade or so, according to a Reuters analysis. Electric motors are simpler, making them easier to maintain and meaning they should last longer. Keeping them charged is cheaper than buying gas, an advantage that will become even more significant if gas prices rise. An electric motor is seen at the YASA factory in Oxford, England, in February 2018. 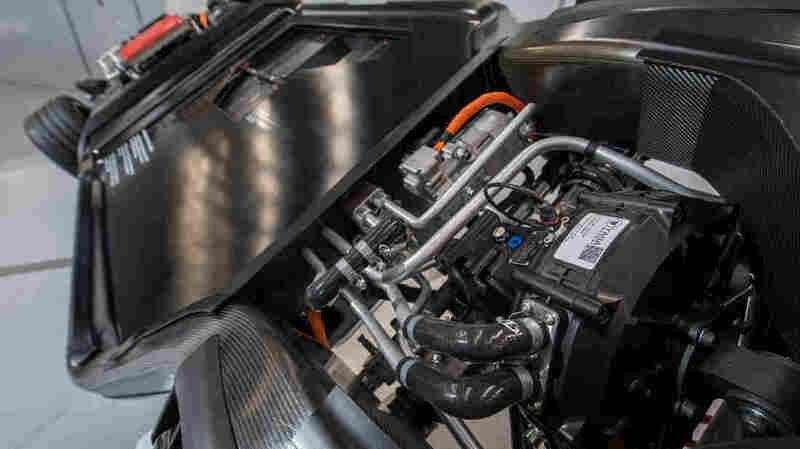 Electric motors are much simpler than internal combustion engines, with fewer moving parts. Plus, "they are fun to drive," says Tom Murphy, a managing editor at Wards Auto, which ranks the world's best engines. "They're enjoyable, they're quiet ... and there's loads of torque" — which means instant acceleration, he says. On the other hand, gas-powered cars are cheaper to buy than electric vehicles. It's also quicker to fill up at the pump than it is to recharge, and the country is packed with gas stations, while charging station infrastructure is still in its infancy. But experts predict batteries will get cheaper, charging will get quicker, and chargers will become more readily available. At some point, industry watchers say, the balance will shift. "Probably in the mid-2020s time frame, it becomes comparable or cheaper to actually buy and operate an EV than an internal combustion vehicle," says Sam Abuelsamid, an auto analyst with Navigant. Felipe Munoz, a global analyst at JATO, predicts electric vehicles will outsell conventional ones by 2030. Other analysts say this change could be slower — but most agree it is coming. Even people who love the internal combustion engine see the writing on the wall. John Woods owns a 1972 Porsche 914. On a recent Sunday, he joined other car enthusiasts at a parking lot in Alexandria, Va., to rev his engine and grin at the sound of it. The internal combustion engine is "the beginning of automotive engineering," Woods says. "But the electric car will be the future." The rise of electric vehicles, however, doesn't automatically mean the end of the reign of the gas-powered car. Putting more battery-powered cars into circulation is only half of the equation. The next question is, what happens to all the combustion vehicles already on the road? One possibility is that they might get replaced quite quickly with electric vehicles. That's what environmental activists want, for the sake of curbing climate change. For instance, the Green New Deal proposed by Democrats calls for phasing out carbon-emitting vehicles within a decade — which would require not only very fast production of electric vehicles but also a sudden withdrawal of combustion vehicles from roads. That's an ambitious target. But some version of that fast timeline could be triggered by very high gas prices or by bans or restrictions on internal combustion vehicles (like some cities have discussed, at least hypothetically). It could also be motivated by consumer choices, argues Dan Neil, automotive columnist at The Wall Street Journal. Electric vehicles "are such better machines than the machines they're replacing," he says, that consumers might choose to retire their gas guzzlers long before the end of the vehicles' useful lives. "Just like plasma TVs," he says. "A lot of plasma TVs didn't see the useful end of their lives before they were replaced by much cheaper, but also much better, LCD screens." Others are far more skeptical of an accelerated timeline and anticipate the two types of vehicle will coexist on the road for a long time. 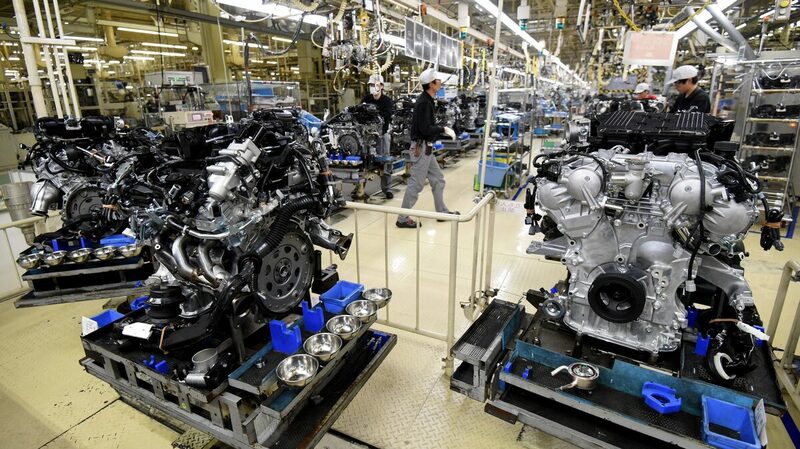 Employees work at the main assembly line of V-6 engines at a Nissan Motor plant in Iwaki, Japan, in 2016. "The average age of a vehicle on the road today is almost 12 years old in the United States," says Abuelsamid, the Navigant analyst. "Even if ... 100 percent of vehicles sold were electric starting today, it would still take 20 to 25 years to replace the entire vehicle fleet with electric vehicles." Bill Visnic, editorial director at the Society of Automotive Engineers, is more blunt. "Combustion engines really aren't going anywhere for quite some time," he says. Mary Nichols, who heads the California Air Resources Board, agrees that internal combustion engines aren't going away anytime soon. "We can't turn them all into planters or sculptures," she says. "So I think we're going to have to provide for them to continue to exist." But Nichols emphasizes that modern cars are cleaner than they used to be. "I started working in this area of air pollution control back in 1971," she says. "And in that time, the air emissions from internal combustion engines have been slashed by over 90 percent — twice." That's important for air quality, a major concern in the world's cities. Meanwhile, improved fuel efficiency has reduced the amount each car contributes to climate change. 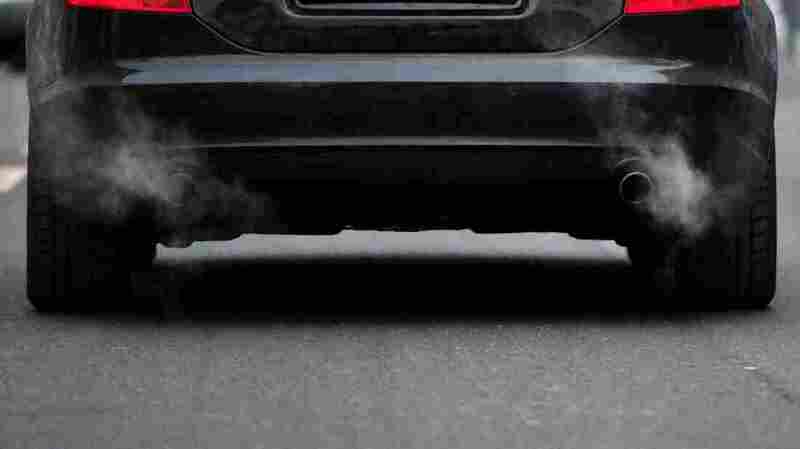 "It highlights the importance of making sure ... that we continue to have standards for conventional vehicles that push us towards more efficient, cleaner combustion engines," says David Reichmuth, a senior engineer at the Union of Concerned Scientists. "In the next five years, we're going to sell an awful lot of gasoline and diesel-powered vehicles, and not having those standards in place will lock in a large amount of emissions." And there's one last wrinkle when considering the future of the combustion engine: The rise of the plug-in hybrid, which can run exclusively off battery power or use a combustion engine. "It's not like the internal combustion engine is just going to go away in the near future," says Murphy of Wards. "It's a little more nuanced than that." The transformation of the auto industry is real, experts say — and happening much faster than skeptics would have predicted just a few years ago. But the turnover of the fleet will take time, and the phaseout of combustion vehicles likely won't be fast enough to satisfy environmental advocates concerned about global warming. "We're moving in the right direction with electric cars," Reichmuth says. "But the question is: How fast do we get there? And, you know, if you look at what we're already seeing with climate change, we're going to have to move faster."